The personal, real-world parallels are not difficult to spot. Set in the 1960s, Poppy Hill tells a simple yet profoundly emotional narrative about two high school students, Umi Matsuzaki and Shun Kazama. Shun, editor of the high school paper, helps lead an effort to save the school’s clubhouse, the historic ‘Latin Quarter,’ from being demolished. Umi, whose mother is away to teach in America, runs the family boarding house, and raises a set of signal flags every morning in honor of her deceased father, who died at sea in the Korean War when she was young. Attraction and fortune bring the two together, as they gradually fall in love, sort through the details of their respective pasts and heritages, and campaign to save the Latin Quarter. The film does not seem directly allegorical in any obvious way, but a meditation on the nature of time – both its relentlessness and repetition – is foundational to the film’s thematic material, and seems to parallel the existential quandary Miyazaki and son must themselves be pondering. Shun and his friends, in their efforts to save the clubhouse, argue that time and progress must not be allowed to wash away every trace of the past. Physical monuments to days gone by, where culture was forged and nurtured, are essential. Initially, the teenagers’ argument is limited to highlighting the connection to the past a building like the Latin Quarter offers, but as the film goes along, it becomes clear that this very same connection is most valuable as a beacon to light the path of the future, offering guidance and wisdom to those who come next. Connections to and musings on the past are often more overt than that. Many viewers and critics have correctly noted that Poppy Hill treads familiar territory for Studio Ghibli, but I believe the repetition is conscious. 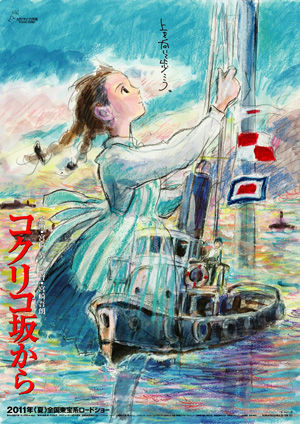 This is a reflexive work, one that actively quotes Ghibli history – an early bonding moment for Umi and Shun happens on bicycle in apparent reference to Whisper of the Heart, the tugboats are similar in design to those of Ponyo, and the film climaxes on a ship called “Ghibli,” to name but a few such moments – and, in its latter half, even plays subtly with the narrative conventions a Ghibli fan might expect walking in. The film is a transitional work for the studio, and while it is never overtly ‘meta,’ its significance as a statement of artistic continuity and development is both obvious and poignant. Nowhere is this more apparent than in the personal narrative, wherein Umi and Shun must investigate and come to terms with their respective family histories. Umi struggles with death, while Shun grapples with family identity, both of which must be highly personal issues to Gorō and Hayao Miyazaki at this phase of their lives. There is such tremendous authenticity to the way these characters process loss and deal with family. This is a hallmark of Ghibli, of course – death, grief, and transcendence are central to both their fantasy and ‘real-world’ productions – but the emotions come through as purely and powerfully as ever here, if not more so, and I do not doubt that the creative union of father and son plays a part in this. Gorō has inherited his father’s talent for illustrating pathos of all sorts; that much is clear. Without forcing emotion or cloying elaborately, the younger Miyazaki stages several subtle, beautiful sequences of characters dealing with grief, through both memory and the pain of present-day absence, with one such scene – a dream, in which Umi imagines her family together and whole once more – standing as one of the most vulnerable, authentic, and devastating moments in the studio’s canon. He also exhibits tremendous comic timing. Humor is essential to Poppy Hill, and the laughs come steadily and naturally, each stemming from a place of deep, abiding affection for the film’s community and its characters. A great number of memorable, expressive personalities have been crafted here, and they are constantly good for a laugh; never cheap or cynical ones, but honest and exuberant gags that are purely enjoyable and entertaining. 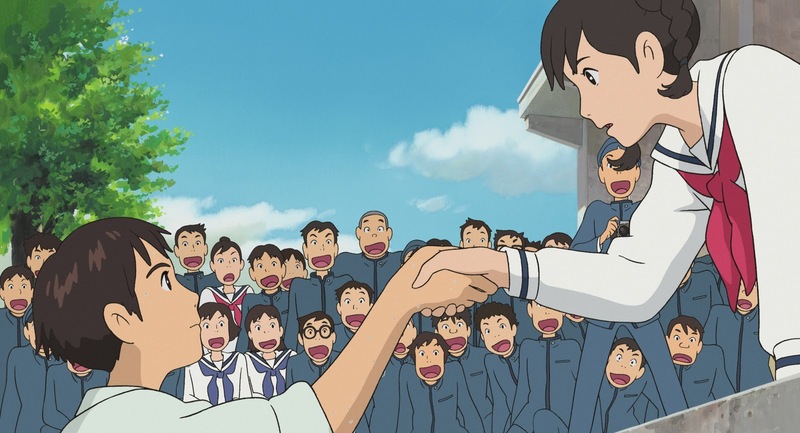 Ghibli is not widely known for its humor, but as character-based laughs go, they have always been remarkably adept, and Poppy Hill is one of their funniest, most joyful experiences. Between these two extremes, Gorō takes time to develop other genuine, if less easily categorized emotions, all of which are familiar to those who have lived through high school and fought for something they love. Poppy Hill is a simple story, but it suggests a universal experience, of that moment in one’s life when they discover something greater than themself, something worth going the extra mile for, and perhaps finding oneself in the process. Narratively and thematically, Hayao Miyazaki’s fingerprints are all over this film, and that is a pleasure. But if the general atmosphere and precise emotions are not proof enough, the animation clearly declares this as a work of his son, and I am overjoyed to see Gorō’s style and voice develop so rapidly. The backgrounds are painterly, as they usually are for Ghibli, but they stem from a visibly different artistic tradition, one that is more impressionistic and less classical, even as the visuals constantly create a warm sense of nostalgia. Character models are simple and fluid – which has been the norm for Ghibli since they returned to all-physical animation techniques with Ponyo – but the way they move is bold and original. I cannot think of another Ghibli film, in fact, so concerned with the basics of human movement. 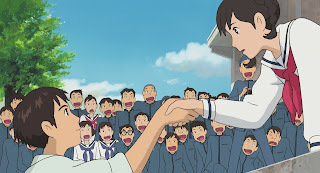 Poppy Hill is bursting with human motion, all of it keenly observed but stylistically presented, with each character’s weight and movement saying something essential about their personality and mindset. Gorō does not strive for strict realism, but he emulates the particulars of motion more vividly than I have ever seen before, and builds several beautifully choreographed sequences out of simple human movement. 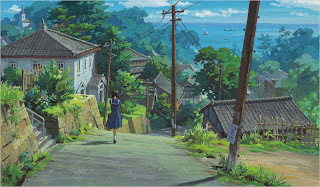 The Port of Yokohama, where the film takes place, is as fully realized a cinematic world as any other Ghibli landscape, with the wonderful music, a mix of original score, original songs, and period recordings, taking great strides to evoke a sense of time and place. The voice work (in the original Japanese, which is how I elected to see the film) is as excellent as one would expect from a Ghibli production, with each actor and actress perfectly complementing the design and personality of their respective character. 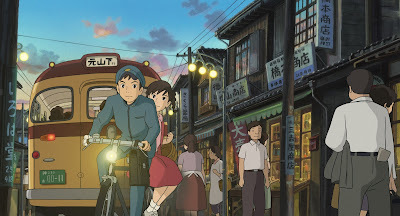 From Up On Poppy Hill is not quite a masterpiece, as many of Ghibli’s films are – the plot twists of the second half are intriguing and earnest, but a tad clunky – but it is a great film, and sometimes a downright extraordinary one. No matter what happens to Ghibli in the future, I am inspired to see the elder and younger Miyazaki work together on such a personal, passionate project. This is a simple film, but it says so much about so many elements of life itself, and I see embedded within the text a message about the future: That though Ghibli will indeed change, as the clubhouse does to survive, it need not die. Death is a natural part of life, to be properly grieved and dealt with as the characters learn, but life itself moves on, and one must choose whether to wallow or march on with it towards the next big step. This studio shall do the latter; we are told so directly by their artistry. From Up On Poppy Hill is currently playing at the Landmark Esquire in Denver, in both English and Japanese. By default, I recommend the latter, though I cannot personally comment on the quality of the former.